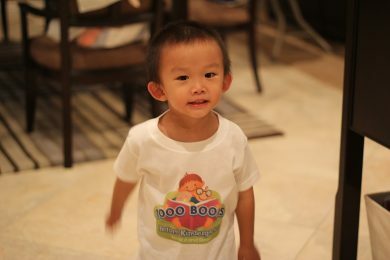 The 1000 Books Foundation had the opportunity to sit down and interview the parents of Jordan. Jordan has just completed the 1,000 Books Before Kindergarten Challenge and we thought it would be a great time to share parts of the interview. 1000BooksB4K: Hi, first, thank you for taking the time to sit down with us to discuss the 1,000 Books Before Kindergarten Challenge. Jordan’s Parents: Absolutely. We love talking to other parents and caregivers about the benefits of the 1,000 Books Before Kindergarten program. 1000BooksB4K: Can you tell us a little about yourselves (what you do for a living, etc.) and your son, Jordan. Jordan’s Parents: Sure, my wife and I are both attorneys. We met in law school and she followed me home one day [wife stares at husband]. May be that part isn’t true. We waited until we were a little older in life to have children. My wife gave birth to Jordan shortly after her 39th birthday. Jordan just recently celebrated his 3rd birthday. I’m not trying to brag, but he already knows his alphabet, numbers, and speaks in full sentences. 1000BooksB4K: Now for the obvious question, why did you get involved with the 1,000 Books Before Kindergarten Challenge? Jordan’s Parents: The short answer is because it gave us something very fun and exciting to do with him. I don’t know about most parents, but at times, raising children can be very difficult and challenging in and of itself. I read about many studies that indicated that it was important to develop a routine to help keep your sanity. Plus, I remembered in high school that there were these siblings that just seemed “smarter” than everyone else. Later in life, I discovered that their parents had read to them constantly when they were younger (starting when they were in the “womb.”) I do not think that anyone disputes the value and benefits of reading to your child when they are young. We just want to give Jordan every possible chance at succeeding in life. Did I also I mention that reading is fun? My wife knows that I always wanted to be an actor and to entertain people and I like reading in different voices, making funny faces, and just being silly with him. [wife nods with approval]. 1000BooksB4K: What kinds of books did you read to Jordan? Jordan’s Parents: Before we even started reading books, I remember showing him these wee gallery infant art cards. According to the package, the art cards provide visual stimulation and entertainment. When Jordan was born, a very good friend of mine, gave us three board books, The Very Hungry Caterpillar, Brown Bear Brown Bear What Do You See, and Goodnight Moon. Interestingly, his son recently went off to college. His son was very academically gifted and my friend told me that the secret was that his son read “a lot”. We also received a lot of books from Jordan’s Aunt, like Kitten’s First Full Moon, Don’t Let the Pigeon Drive the Bus, and a collection of books by Sandra Boynton (Pajama Time, Oh My Oh My Oh Dinosaurs, and Barnyard Dance). Most of the books that we read to Jordan were also borrowed from the library. We go to the library about twice a week to borrow books. Jordan loves going to the library. Quickly glancing at the reading log, it appears that the Mercer Mayer’s Little Critter series was the most read. 1000BooksB4K: Does your library have a 1000 Books Before Kindergarten program? Jordan’s Parents: Yes. Our local library has a 1000 Books Before Kindergarten program. The librarians are awesome. They helped with selecting good books. They are always very friendly. Jordan would throw slight tantrums when the books that he wanted were not available and the librarians were always very accommodating saying that they would order more books and recommending new books. During the summer they also had another reading program. Jordan received a medal after he completed reading 20 books. 1000BooksB4K: Did you use the 1000 Books Before Kindergarten iPhone APP? 1000BooksB4K: How long did it take you two to complete the 1000 Books Before Kindergarten challenge? Jordan’s Parents: We took the “pledge” in January 2013. We completed the challenge in September 2014. 1000BooksB4K: Any last things that you want to say about the 1000 Books Before Kindergarten challenge? 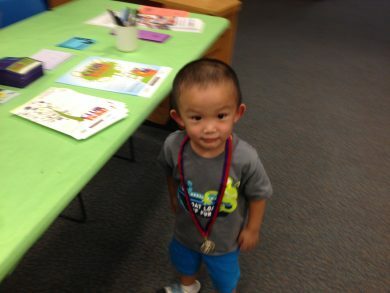 Jordan’s Parents: The 1000 Books Before Kindergarten challenge is very manageable and we hope that other parents will take up the challenge and read more to their kids. We’d like to also thank the 1000 Books Foundation for helping to raise awareness of the benefits of early childhood literacy. Can I get a t-shirt? [The t-shirts are free with a $25.00 donation to the 1000 Books Foundation].